Flutist and music entrepreneur Susanna Loewy received a BM and MM from the Cleveland Institute of Music and a DMA from Rutgers University. Her principal teachers were Jeffrey Khaner, Joshua Smith, Bart Feller, and Philip Dunigan. 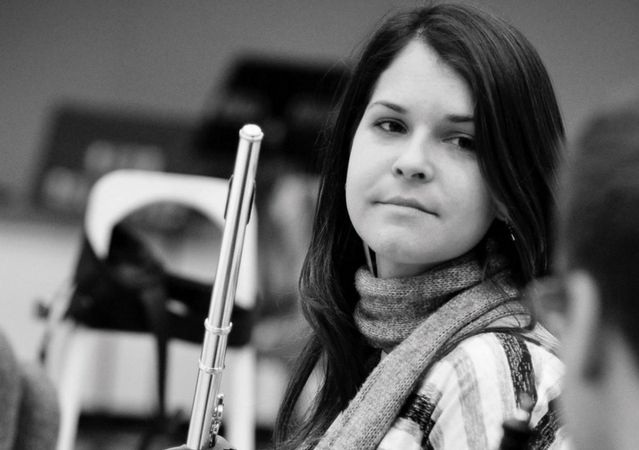 Susanna is currently the Assistant Professor of Flute at Kutztown University, is a Teaching Artist for the Philadelphia Orchestra and Project 440, and is the founder/curator of the Pikes Falls Chamber Music Festival in Jamaica, VT. Susanna is also a Powell Flute Master Teacher. Susanna is the Principal Flutist and Project Manager for Inscape, a chamber music group based in the DC area that was nominated for a Grammy for its debut CD, “Sprung Rhythm.” The group’s second CD, “American Aggregate,” was released in 2014, receiving favorable reviews. Inscape’s most recent recording project, released in August of 2015, is a 17-player chamber orchestra arrangement of Stravinsky’s Petrushka. Susanna has played with the Philadelphia Orchestra, the Pennsylvania Ballet, The Louisiana Philharmonic Symphony Orchestra, Peter Nero and the Philly Pops, among other groups in the Philadelphia area and across the country. Susanna played at Carnegie Hall/Weill Hall in February of 2013, premiering the new works of three contemporary composers. Susanna is a Digital Faculty Consultant for McGraw Hill Education, and represented Music Education at McGraw Hill’s Winter convention. Also for McGraw Hill, Susanna created a series of webinars on creating a flipped-classroom within large lecture classes. Partly because of these teaching innovations, Susanna was a quarter-finalist for the 2015 Grammy Music Educator Award. Susanna is a writer and reviewer for several musical publications. She has written for the Powell Flute Teaching Website, The Flute View, and is a newly-published music reviewer for The Flutist Quarterly. She was also one of 10 authors to contribute to The Daily Book of Classical Music. Outside of the musical realm, Susanna is a certified Spinning teacher and Triathlon/Marathon coach; she is a writer/photographer for athletic-based journals and has been a sponsored IronMan Distance Triathlete. She is currently a CrossFit enthusiast. With her students, Susanna encourages a healthy and active lifestyle.